Old Book: In the earliest years of the 20th century, the Peoria State Hospital in Bartonville was home to a dear, mute man known only as A. Bookbinder. 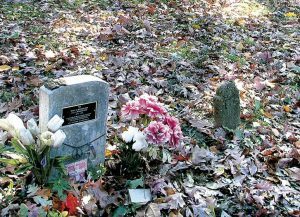 Strong and steady, he would dig graves for asylum funerals, ending each by sobbing hysterically and leaning on a tree that became famously known as The Graveyard Elm. In June 1910, Old Book went the way of all men, and the entire asylum came out for his farewell. 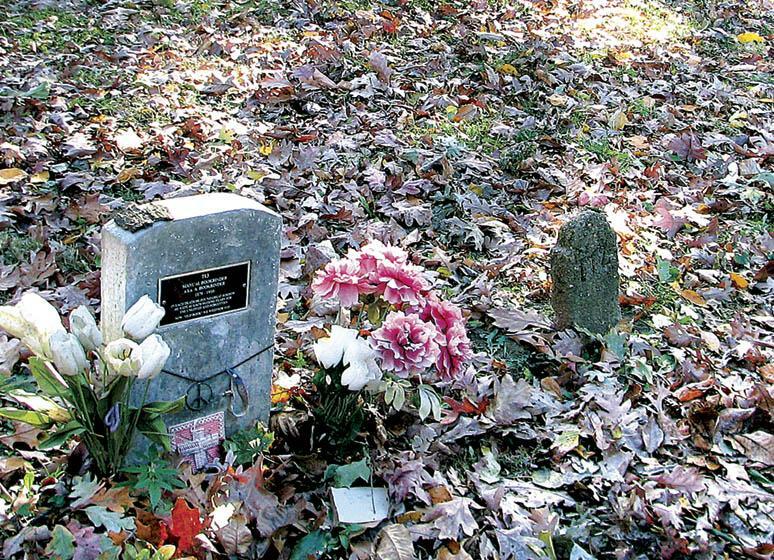 Near the end, an apparition appeared at the Graveyard Elm. Piasa Bird: The Piasa (pronounced PIE-ah-saw) Bird — actually more like a dragon, with red eyes, menacing beard, scales and lengthy tail — preyed on Native Americans, eating them alive until a local chief, Chief Ouatoga, lured it out of its cave, using himself as bait. When the creature flew out, an ambush of warriors slew it with a volley of poisoned arrows. A mural was said to have been painted (possibly more than 3,000 years ago) as a commemoration of the event. 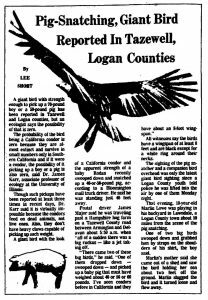 This story in the Peoria Journal Star in July 1977 highlights reports of the appearance of giant birds in central Illinois. 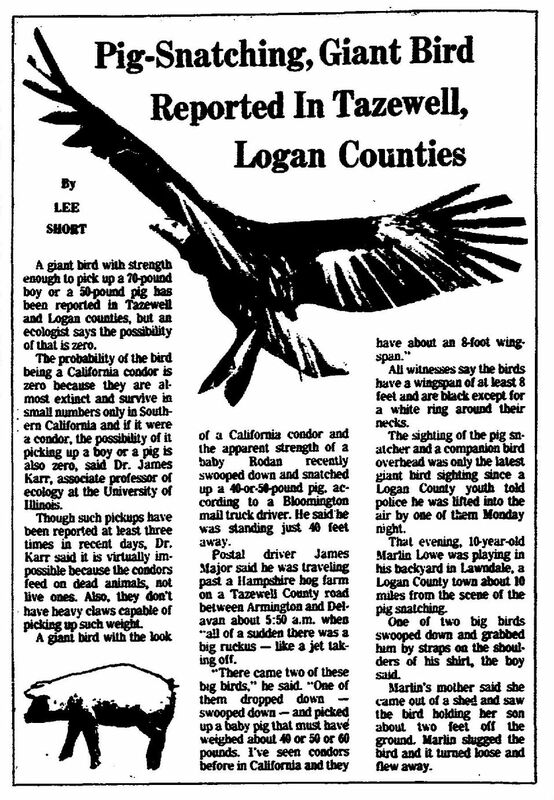 The birds supposedly picked up a boy and a pig. Murphysboro Mud Monster: This hairy, smelly biped (a.k.a. “Big Muddy”) was seen several times in the summer of 1973 lurking near Murphysboro along the banks of the Big Muddy River. 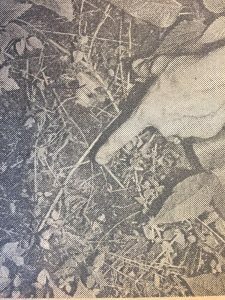 Like Peoria’s Cole Hollow Road Monster, the Murphysboro creature was described as being 7 feet tall and covered in matted, white fur. Police officers found several tracks at the scene of the first sighting, and even heard its “inhuman” cry. PHIL LUCIANO can be reached at pluciano@pjstar.com, facebook.com/philluciano and (309) 686-3155. Follow him on Twitter at @LucianoPhil.